Jon Karl Helgason. Echoes Of Valhalla; The Afterlife of the Eddas and Sagas. Reaktion Books 2017. The Snorra Edda is one of the oldest manuscripts we have that recounts the medieval Icelandic sagas. Dating from 1220 it was compiled and partly written by Snorri Sturluson. Three years ago I was in Reykjavik hoping to view the Snorra Edda and other manuscripts at the National Library of Iceland. Echoes of Valhalla contains a fascinating two page Timeline from 870 to 2015 showing key dates in the establishment of Iceland, its early legends in poetry and prose, and the international influence of the Viking myths and sagas as realised in novels, plays, films, music, theatre opera and even heavy metal. Yet here arises a problem, for this book, that isn’t overcome. Although we have a long list of works of art (separate from Icelandic literature) very few have proved to be really substantial works of art that authentically echo those ancient tales. Too many of Helgason’s examples simply allow him to retell stories, plotting and characters with their suggested connections and ideas. But does that necessarily mean the new creations are that culturally important? 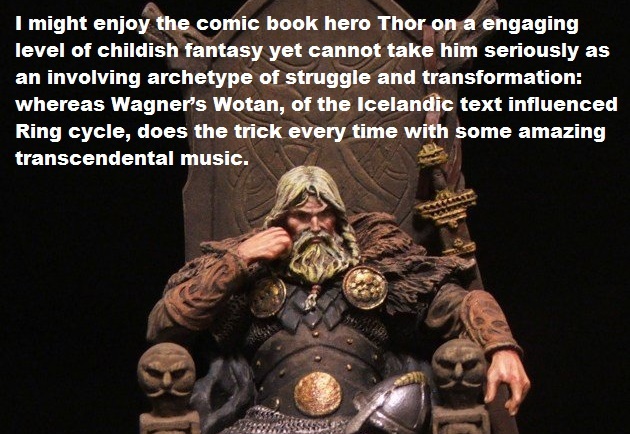 I might enjoy the comic book hero Thor on a engaging level of childish fantasy yet cannot take him seriously as an involving archetype of struggle and transformation: whereas Wagner’s Wotan, of the Icelandic text influenced Ring cycle, does the trick every time with some amazing transcendental music. For Helgason this doesn’t mean that the works he will discuss in Echoes of Valhalla are “any less interesting or important.” Not less interesting, perhaps. But important? The pitfall for any modern re-working of the Sagas is the negative consequence of pastiche. And the more ancient the story that’s re-told the more unable we are to accurately reproduce its mind-set in art. In the original Sagas that I’ve read there is a dark inner sense of brute force and foreboding. In too many modern adaptations and borrowings this has been softened to create a heroic here and now of facile Viking adventurism. Helgason can get bogged down (forgive the Icelandic pun) in too much paraphrased material. The arguments of his book need to be longer and more analytically explored. Less subjects with more substance. But to be fair to the author there are some very interesting parts touching on areas for further research. The chapters on travellers to Iceland, Ibsen’s play The Warriors/Vikings at Helgeland, Richard Wagner’s music and Snorri Sturluson are reason enough for acquiring this book.